After the death of my parents, it's up to me--as the newest delegate for humanity--to bargain with our vampire overlord. I thought I was ready. I thought I knew everything there was to know about the monsters. Then again, nothing could have prepared me for Lord Valentine... or his son. Maybe not all vampires are killers. Maybe it's safe to let one in. 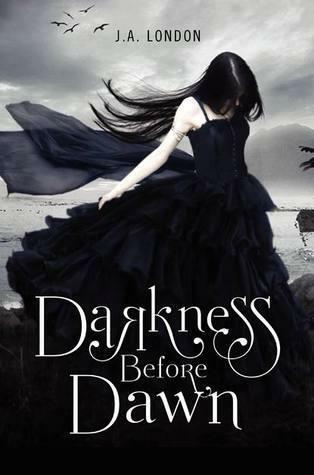 I started Darkness Before Dawn expecting another paranormal YA along the same lines as so many others, and to some extent it is. There are, of course, the standard requirements - teenage girl, 'bad' boy, supernatural danger - but I felt this book handled these elements in a refreshing and interesting way. I did guess some of the plot twists before they happened, but it was still a hugely enjoyable read. Dawn is feisty and independent and Victor will appeal to all the young girls out there, I'm sure. In fact, I could definitely see this book doing well in a screen adaptation. The prose is easy going and the plot moved along at a good pace without feeling rushed. Naturally, I ground my teeth at the cliff-hanger ending, but that seems to be par for the course these days. In conclusion, a fun read for all YA paranormal fans and a series that I will be happy to continue reading. This sounds really good, Nicki, even if I'm not the target audience. Then again, I enjoyed Twilight too.